Globalization has made agriculture more competitive in a way that access to and control of farm resources is extremely important. 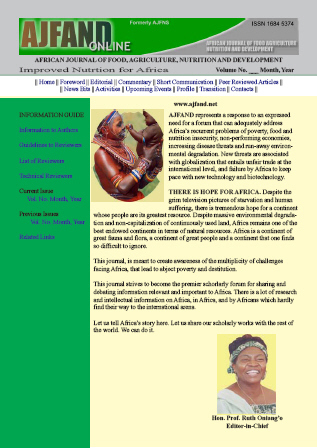 This study examines rural women’s access to farm resources in arable small-scale food production in the North West Region of Cameroon. Using a multistage sampling technique a total of 1,120 rural women farmers were surveyed in order to capture their socioeconomic characteristics and access to arable land, agricultural inputs, agricultural extension information and source of finance and involvement in food production in smallholder production systems. All data collected was subjected to descriptive statistics. The results showed that rural women have access to arable land through their families but they do not control arable land. They have access to agricultural inputs but lack rural feeder roads and access to agricultural extension information and/or services. Rural women farmers lack finances and mostly access finance for arable agriculture from traditional social groups and their husbands to solve additional constraints of poor soils, pests and diseases. The rural women are involved in major crop production activities (land preparation (ploughing/ridging), sowing, weeding, harvesting and storage) which necessitate access to and control of farm resources but have limited access to resources in order to be efficient and competitive. Because of limited control of farm resources, they are not involved in decision-making, which usually translates into lateness in carrying out farm operations and consequently low yields. Access to land resources by rural women is controlled by cultural and technical factors. Boosting crop production will require that efforts are made socially and technically to remove the afore-mentioned barriers in the acquisition of farm resources. Therefore, agricultural production policies and programs should establish direct linkage between agricultural extension information and/or services, and rural women farmers, and provide incentives to rural women involved in arable small-scale agricultural production in order to maintain a steady growth rate of food production.